On the panel on the right of this blog, you can find the top three or four most popular posts. That’s measured by the number of comments a post receives, not the number of visits. 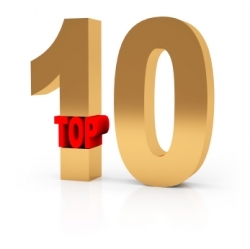 Below is a list of the ten most visited posts for 2011. Do You Overcorrect Your Child’s Spoken English? I find it interesting (and a bit humbling) that I only really wrote four of the ten most popular posts on my blog! “Essay Mills” is a guest post, “Seven Bar Jokes” and “English Teacher Gone Bad” were funny items I found and shared. “Halloween Candy” and “Words that Flip Flop” I actually wrote, but they were basically reviews of a book and an article by others. And I just posted the “Infographic” after finding it on another blog. 1People like comic posts, like “Seven Bar Jokes” and “English Teacher Gone Bad.” The most visited post at the moment is a recent one called “How English Teachers Really Grade Essay Tests” and it’s a scream. Great. I like to laugh too, so I’ll keep looking for writing and word-related ideas that tickle the funny bone. It’s helpful to see what people tend to view the most. Maybe I can do an even better job this year of posting stuff people want.Any other insights or suggestions? I’d love any input you can give me on what kind of posts and articles you like best!